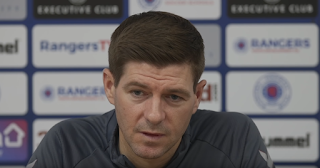 Steven Gerrard has dropped a subtle hint that Kyle Lafferty’s Rangers career is as good as over after he strongly suggested Jermain Defoe will be the striker of choice in the next three matches following an impressive night against Hearts. Admitting Defoe will start tomorrow, and failing to rule out more starts for him thereafter, Gerrard made no mention of the elephant in the room that is Lafferty, where the NI star would have hoped to have taken some kind of advantage of Alfredo Morelos’ enforced absence from the first team. Signed amidst much fanfare and hype, Lafferty was expected to push Morelos for starting places, and make a healthy chunk of appearances, but the former Norwich man’s return to Ibrox has fallen flat and that he didn’t even make the bench for Celtic and can’t displace Defoe in the starting XI surely sounds the death knell for his chances of making it under Gerrard. He may well be one of the ones ‘moving on’, as Gerrard put it, but given his wage it would have to be mutual consent with a fairly substantial pay off if that was to be the case. Lafferty has nobody to blame but himself. Surely in the absence of Morelos Lafferty is one place closer to the first team. I did warn before he signed that his scoring record wasn't that great but despite that I still say he hasn't had a fair shot. This bringing players back to our club that left previously under dubious circumstances was never going to work. Another chancer back that should never have been. Now people want him out the club. Nothing blind as to those who cannot see.